When you decide to start paramotoring, you'll be tempted to go straight out and buy a paramotor and wing, to kick start your journey to the skies. Most aspiring pilots go ahead and buy all of the equipment before they've even booked their training. I'm actually guilty of doing this myself when I made the decision to start paramotoring, and what a mistake that was! In this post, I'll help you to avoid some of the mistakes that I've made, that ended up costing me a lot of money. We'll also look at many other common beginner mistakes, to help guide you on your way to your first flight as smoothly as possible. So without further ado let's look at a big mistake the majority of beginners make. So why is it a bad idea to go out and buy your equipment before you start paramotoring? Firstly, how do you know that you'll actually enjoy paramotoring? Watching people flying paramotors from the ground, is a lot different to actually flying one yourself. You might spend a few months wages buying a paramotor and wing, only to find out it's not for you. Paramotoring is not for everyone, it can actually be very nerve racking for new pilots, and many will decide not to continue flying. I'm not saying you can't overcome these initial nerves, as you most definitely can, but make sure you really like it first. Secondly, if you've never flown a paramotor you really shouldn't be buying one, new or secondhand. You'll learn a heck of a lot about equipment during your training, so you'll have a better understanding of what to look for, and what paramotor to get for your specific requirements. At least wait until you've flown one of the training schools motors, so you have something to compare it to. 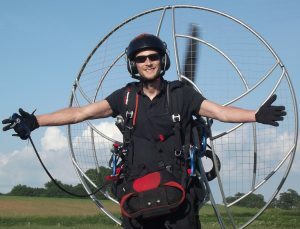 Many new pilots have the misunderstanding that all paramotors are the same, and that it's just a harness and an engine. This isn't the case, there's actually many differences, as you'll find out in my article HERE. When I started flying, I went out and bought a secondhand paramotor with no previous experience, and I thought I had a bargain. The description on Ebay was really tempting, and it sounded great, so I went and viewed it. 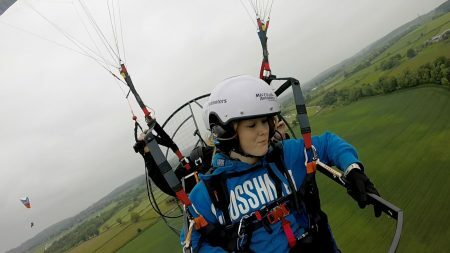 After looking at the paramotor it looked clean, only 50 hours use, lots of thrust (so I thought), and I paid £3500 with a wing, and a few other bits and bobs. I was one happy chappy! Below is the picture of that actual paramotor, a HE R120. I had nothing to compare it to at the time, and I had no idea how much thrust I'd need to get off the ground. When it came to flying it during my training, it didn't have anywhere near enough power. I was pulling brake down to my knees just to get off the ground, and when it came time to clear the first hedge, I literally only just made it. The motor was at full throttle and climbing at about 10 feet per minute! A few days later I also found out the frame was bent, and taking off the R120 engine cover, revealed an R100 engine. That explained the lack of power I had experienced! Then to top it off, during my third flight, a bolt fell out of the engine and destroyed the propeller. And that was the end of that motor! So what I'm trying to say is, although a motor may look good, it may turn out to be a huge pile of junk! For more help on exactly how to choose your first paramotor, go HERE. I actually got lucky with the wing, and it turned out to be just what I needed. But I know other pilots that have bought the wrong wing size or rating, some have even bought small paragliding wings thinking they would suit a paramotor. It's easy to get confused as a beginner, but when you're ready to pick your wing, you'll need THIS POST. The post includes everything a new pilot needs to know about wings, from ratings and reflex gliders, to buying used wings. You can also check out THIS POST to find out exactly what the sport is like from a long time pilots perspective. There will be a heck of a lot that you need to know that isn't covered during training. Training is short, and 95% of your time will be spend on the field or in the air. So the first thing to do is expand your knowledge with books, articles, and by flying with others. 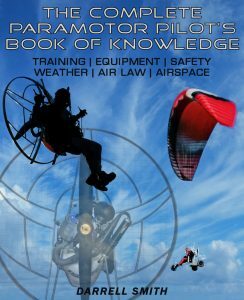 You can start right now by downloading 143 pages of paramotoring knowledge HERE. Before you start paramotoring get a tandem flight! A great way to see if you'll like paramotoring before cashing out on training, is with a tandem flight. You'll be taken up for a nice long flight, and although it's not quite as exhilarating as flying a paramotor by yourself, you'll still get a good idea of what it's all about. This is something else I neglected to do before booking my training. A tandem flight would have given me a better idea of what to expect during my first flight. Below is a picture of my girlfriend during her first tandem flight. This is a great way to experience what it feels like to fly a paramotor, it also gives you a better understanding of what it's like to launch and land. And if you get a nice pilot, you might even be able to take the controls! When you've completed your tandem flight, you'll be ready to start paramotoring. It's now time to find a good school with quality instructors. Check out a list of the best schools and instructors in the UK and US HERE. One school I can recommend because I trained there, is Skyschool. They run courses throughout the year in the UK, Italy, and Spain, and use only the most experienced APPI PPG qualified instructors. The Skyschool course will teach you everything you need to know in around six intensive days. By the end of the six days you're guaranteed a solo flight. You'll learn basic theory of flight, air law, and basic meteorology. Out in the field you'll learn ground handling and launching, and you'll get pulled into the air using a rope. This will get you used to leaving the ground and flaring the wing. You'll also learn about wing care, folding and packing, and line untangling, which is essential. You'll do a hang test to correctly set up the paramotor for your weight. And at the same time learn how to get in and out of the harness, and how to weight shift. You'll also learn all about reserve deployment, and how to do pre flight checks on the motor and harness. Before you're first paramotor flight, you'll do top to bottom paragliding to get the hang of the wing. Many schools push people straight into the air on a paramotor, before doing any gliding, which in my opinion is a bad move. It's better to fly without the motor first, and Skyschool have the perfect site for it. So overall it's a very thorough course that will cover everything a new paramotor pilot needs to learn. The instructors are highly experienced, but also fun and friendly, and the course prices are very affordable. Read all about my full training experience with Skyschool UK HERE. If you're in a different country, or if you need a school closer to your location there are other good options. Before booking, ask as many questions as possible, make sure they can offer a course similar to the one listed above. Check google and social media for reviews of the school, and make sure others are happy with the training. And don't book until you are entirely happy with whats on offer, there's always other options. This will ensure you enter the sport as safely as possible, with the best possible instruction. Remember, there are currently no legal requirements for paramotor instructors, or training schools. That means anybody can start a school and offer you training, anybody! Unfortunately, inexperienced pilots are starting schools in the hope of making a quick buck. I recently found out about an inexperienced pilot starting his own training school. He'd been flying for a few months and only spent approximately 30 hours in the air. He was offering tandem flights, and full training courses to pilots, and even trying to sell them equipment. These beginners had no idea that he was also very new to the sport, and probably only knew the basics of flying. With this in mind, be very weary before handing over any cash, and as previously mentioned, do your research. When your training is complete, you'll be ready to buy your equipment. Your instructor should be able to give you good advice, and point you in the direction of the best manufacturers. The best beginner wings will be EN-A certified, this means they're easy to launch, and are very safe and stable in the air. Before buying, check that you fall withing the weight range of the wing, this will be listed on the specifications. This includes your weight, plus the paramotor weight, plus any other items you take when you go flying; like a helmet and reserve for example. When buying a paramotor, it's always best to buy the newest possible technology. 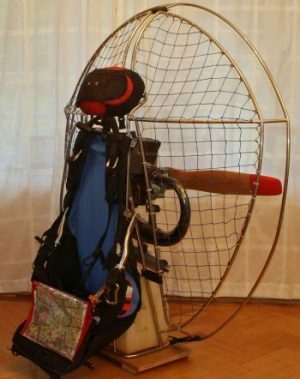 Paramotors have changed immensely over the last 10 years, so an old machine may suffer from problems like thrust induced pitch behaviour. This means the paramotor will pitch forward under power, which decreases thrust efficiency, and gets very uncomfortable. Choose a paramotor with a nice strong frame that will withstand any knocks you may have. Check that you can lift the paramotor fully fuelled, and choose an engine that offers enough thrust for your weight. Again check out my paramotor and wing buyers guides that I linked earlier for a full guide. The first thing every pilot should buy is a ground handling harness. Ground handling is super important, and perfecting it will make launching a breeze. Even after completing your training, ground handling should still be practised at every opportunity. Here's the harness (link to Amazon) I bought for my girlfriend to practise with, which works great. You should also buy yourself a helmet, and ear defenders to protect your hearing from the engine noise. My helmet buying guide with the top 5 helmet choices is HERE. A windsock and pole are also essential as the wind direction can change very fast, downwind landings aren't fun. There's a lot of equipment you'll need to get before you start paramotoring, so check out my equipment article for everything you'll need > HERE. If you only have a small vehicle you may also need a way to transport your equipment to the field. A carry rack that fits onto your tow bar is a great option, check out THIS POST to find out how to get one. You're now ready to start paramotoring, and you'll be able to avoid some of the common mistakes new pilots make. Paramotoring is one of the most enjoyable experiences you'll ever have, and those first flights are the best of all. I wish you the best in finding a great instructor, getting great training, and buying your first setup. Now you know how to start paramotoring why not take a little lesson? 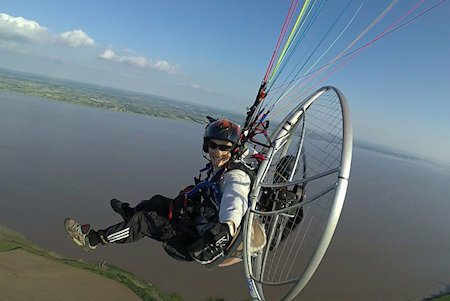 Check out some theory of flight, and get your first paramotoring lesson for free > HERE. Find out exactly how a paramotor works by going > HERE. Minimise the risk of an accident, we look at the top risks and causes of injury in the sport > HERE. Is paramotoring safer than paragliding? Find out > HERE. And if you've been told paramotoring is safe for everyone then you need to think twice and read > THIS POST.